In this episode, Frank and Andy chat with Amanda Lange, technology evangelist at Microsoft, games journalist, and data aficionado. Sponsor: Audible.com – Get a free audio book when you sign up for a free trial! 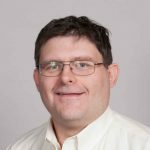 Frank La Vigne is a software engineer and UX geek who saw the light about Data Science at an internal Microsoft Data Science Summit in 2016. Now, he wants to share his passion for the Data Arts with the world. He blogs regularly at FranksWorld.com and has a YouTube channel called Frank's World TV. (www.FranksWorld.TV). Frank has extensive experience in web and application development. He is also an expert in mobile and tablet engineering. You can find him on Twitter at @tableteer. We know you're busy and we appreciate you listening to our podcast. Having high ratings and reviews helps us improve the quality of our show and rank us more favorably with the search algorithms. That means more people listen to us, spreading the joy. And, can't the world use a little more joy these days? So, go do your part to make the world just a little better and be sure to rate and review the show.